Can you please provide us additional information so we know how best to schedule you? Also, please indicate who has referred you. We know it is hard. We are here to help. 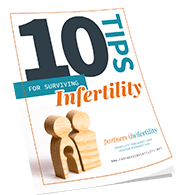 Enter your name and email address here and we will send you our gift, Ten Tips for Surviving Infertility. Address: 414 Penn Avenue S.
Copyright © 2018 · Partners (In)Fertility · All rights reserved.